The first step is to choose a good toothbrush. You always want to use a soft brush with a small head. A soft brush is hard enough to remove plaque and soft enough not to damage your teeth or gum. The next issue is to choose a good toothpaste. In general any toothpaste that contains Fluoride will do the job, unless you have a special need that is determined by your dentist. Two of the best brands of toothpastes are Colgate Total and Crest Multicare. The first rule of brushing is to start from a specific location and work your way to the opposite side and all the way through the whole mouth so that you end where you started. This way you won’t miss any area. Also usually a pea size of tooth paste is enough. A good brushing should at lease take 2 minutes and ideally around 4 minutes. There are many different techniques for brushing your teeth but one of the most popular ones is described here: Hold the brush with a 45 degree angle toward the teeth and the gum. Gently press against the gum so the tips of the bristles go in between the gum and the teeth. Then apply lateral vibration for a few times and roll down the brush to sweep the plaque away from the teeth and the gum. Repeat this motion 6 to 10 times and move on to the next area of 2 to 3 teeth. If your mouth is full of foam, spit out and continue brushing. Your brushing is completed when you have brushed all the surfaces of your teeth and not when your mouth is full! On chewing surfaces, short strokes will work best to get the plaque out of the grooves and pits. 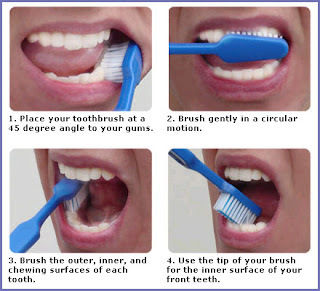 Also when brushing the front teeth from inside, hold your brush vertically to be able to reach the teeth better. As far as frequency of brushing is concerned, ideally you want to brush your teeth after each meal. But if you can t, brush at least twice a day after breakfast and before going to bed.